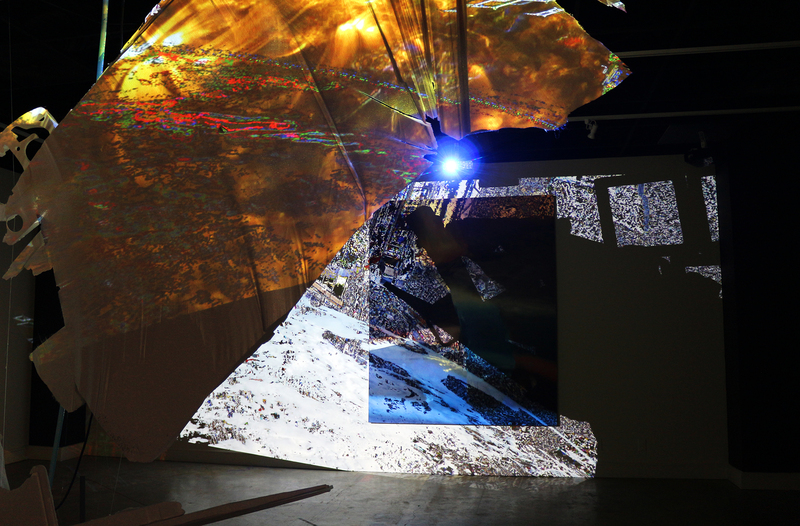 Tra Bouscaren engages in “speculative projection and mobile installations”. For Rituals of Technowhere, the artist uses multiple projectors and custom live motion tracking software to capture the image of the live audience and build it into highly chromatic, saturated, fragmented and processed video projecting on a Styrofoam “iceberg” floating in the pool. This work will visible after dark, both Friday April 29 and Saturday April 30. On Friday night, Bouscaren’s media installation is in collaboration with a live performance/video by artist Krisztina Lazar, who swims in the pool amidst the iceberg, to emerge, and continue a live vocal performance, ending in balloon popping. She is also providing additional content footage for the live video projection and her live performance will be captured and integrated into the projection. Lazar’s performance includes a sound track.